The arrival of spring puts us in an annual state of flux. From April showers to sunburnt summers, we are destined to be second-guessing the weather until October comes around again. 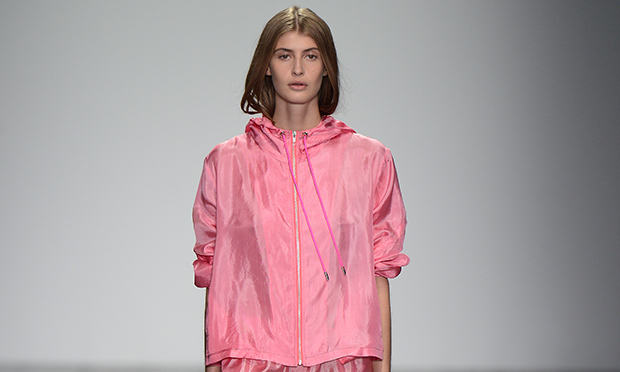 So it is lucky that a practical combination of rain macs and walking sandals, durable fabrics and sensible silhouettes, defined the Spring Summer ‘15 collections, unveiled at Fashion Week back in September. Our guide draws on an unusual combination of practicality and sartorial goodness, with a firm nod to East London’s top fashion names. from recycled plastic, available at sustainable retailers 69b Boutique, on Broadway Market. Tackle unpredictable weather with layers. A host of emerging designers are creating interesting silhouettes through systems of layering. Louise Alsop’s second season with Fashion East – an incubator for British fashion talent – gained attention for its grungy monochrome aesthetic. The collection is a rebellious combination of slashed fabric, frayed oversize tees and dresses on top of skimpy sportswear crops and skirts. The brand 1205, headed up by ex-Savile Row designer Paula Gerbase, also adopts layers, producing striking silhouettes and practical details through loose fit shirts and mid-length skirts in cool starched white, with belted waists. 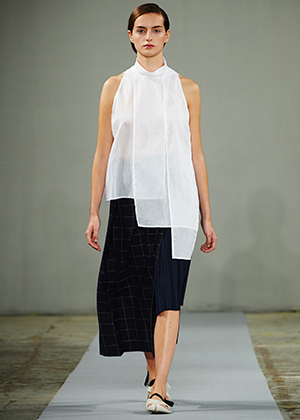 At British heritage brand Margaret Howell, monochrome flat leather sandals were paired with contrasting socks (another take on layering), while Antipodium matched their feminine dresses with full-on Velcro walking sandals (as did Raeburn), and Eudon Choi also adopted flats. With or without socks, sensible sandals bring a contemporary and structured element to an outfit as well as being good for your feet. Durable, and currently being fashioned into everything from crop-tops to parkas, denim is the fabric for spring. Thanks to the likes of East London stalwarts Marques’ Almeida and newbie Faustine Steinmetz, jeans are being re-imagined, as flares, in boot- cut, baggy and cropped. Denim also embraces the current penchant for the seventies. Lower Clapton Road’s Bad Denim offers an edit of the best jeans from international brands including NEUW and Paige. From J.W. Anderson’s shady wide- brimmed leather hats, to ADAISM’s paper-bag style clutches made from cork, suede and metallic leathers, spring’s accessories embrace unconventional materials and simple functional design. ADAISM’s tactile rolled up sacks are available from LN- CC on Shacklewell lane.